DISTRICT LODGE BM-ES CLAY HERFORD, center, accepts the top NACBE safety award on behalf of Local 587 (Orange, Texas). Joining in the presentation are (l. to r.) NACBE Exec. Dir. John Erickson, outgoing NACBE Pres. Greg Purdon, IVP-SE Warren Fairley and IP Newton Jones. 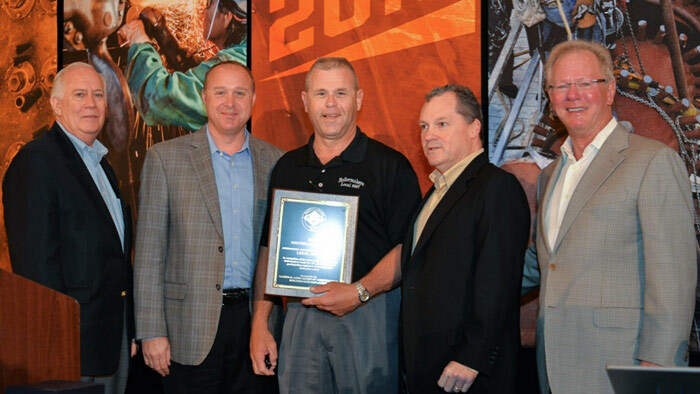 THE NATIONAL ASSOCIATION of Construction Boilermaker Employers (NACBE) presented its annual safety awards to the 2015 top-performing locals from the Boilermakers’ four U.S. vice-presidential sections during the Construction Sector Operations conference held at Marco Island, Fla., Feb. 20-Mar. 3. Local 587 (Orange, Texas), representing the Southeast Section, took national honors, with zero lost-time accidents, zero compensable injuries and zero OSHArecordable injuries. Lone Star District Lodge Business Manager-Executive Secretary Clay Herford accepted the award on behalf of the lodge. The Lone Star District comprises Local 74 (Houston), Local 132 (Galveston, Texas), Local 587 and Local 592 (Tulsa, Okla.). The award was based on safety performance during 2015. The three other lodges finishing first in their sections included Northeast Local 667 (Winfield, W.Va.), James King, BM-ST; Great Lakes Local 85 (Toledo, Ohio), Tim Timmons, BM-ST; and Western States Local 11 (East Helena, Mont. ), Jess LaBuff, BM-ST.
NACBE Executive Director John Erickson said the safety index covered nearly 58 percent of all construction Boilermaker man-hours worked in 2015. Incidents are calculated per 200,000 man-hours worked. The compensable injury rate improved by .5 percent over 2014 to 4.49 percent, setting a record low. (By comparison, the rate stood at 83.02 in 1990, the first year NACBE began tracking safety performance.) OSHA recordables dropped from 1.69 percent in 2014 to 1.54 last year. Meanwhile the lost-time injury rate for 2015 showed a slight uptick to .017 over 2014’s 0.16. The record low since the index began stands at 0.12. Thirty-nine locals had zero lost-time injuries, down from 40 in 2014. Thirteen locals recorded zero compensable injuries for 2014, down from 16 in 2014. Safety awards are based on the lowest injury rates followed by the highest percentage of Boilermaker man-hours from NACBE contractors participating in the index.